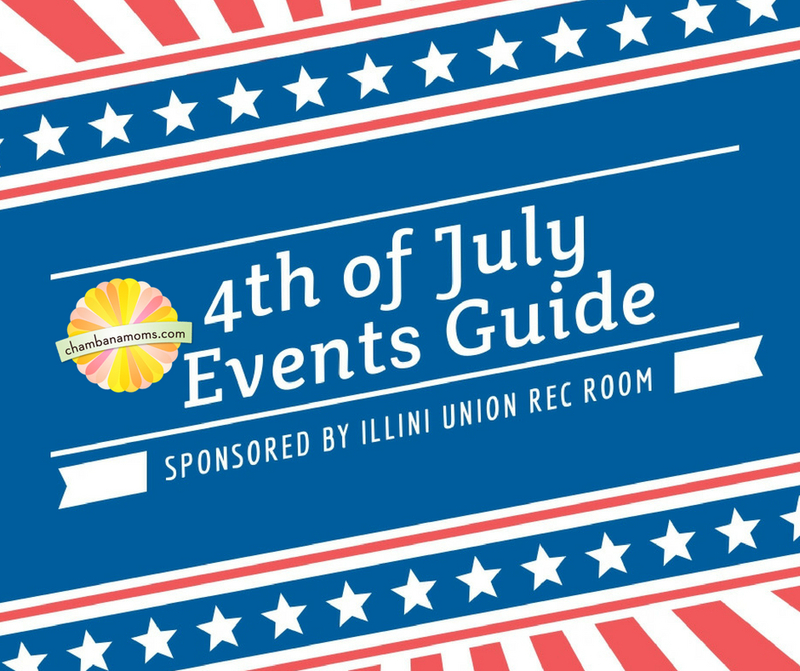 Thank you to the Illini Union Rec Room for sponsoring the 2018 Champaign-Urbana Area Fourth of July Events Guide. Want a great way to beat the summer heat? Checkout the Illini Union Rec Room (located on the lower level)! It has 14 bowling lanes, 12 pool tables, and an assortment of gaming options. This family-friendly location is smoke and alcohol free and has discounted prices Monday-Friday before 4pm. 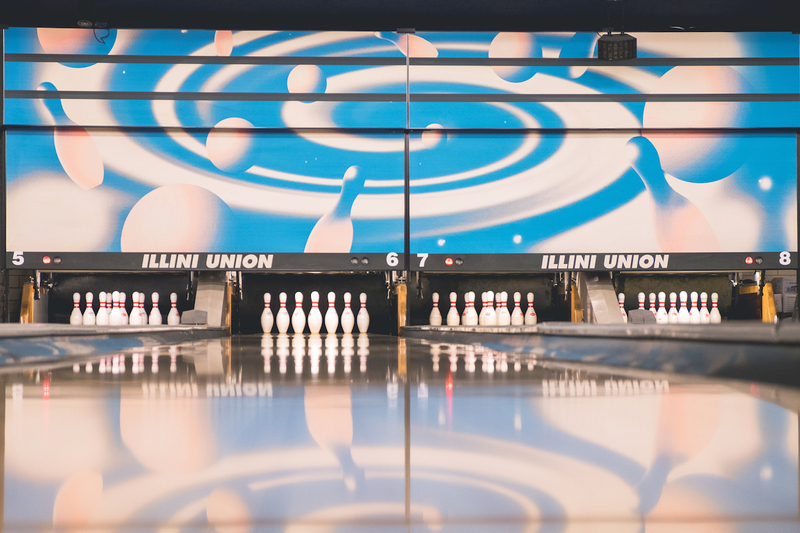 Kids 13 and under can join the Kids Club and receive a Buy One, Get One FREE game of bowling. There are also great birthday party packages available. Summer is a great time to check out this on-campus fun spot with hours from 11:30am-11:30pm (M-F) and 5-11:30pm (Sat/Sun). Please note: Hours will change slightly starting July 1. Check website for updates. See why we think the Illini Union Rec Room is a best kept secret! With the Fourth of July on a Wednesday this year, celebrations will still be going strong. Don’t miss your favorite event – put it on your calendar today. The best news: many of these events are completely free, and any admission prices are indicated where applicable. Enjoy your Fourth of July, Champaign-Urbana! 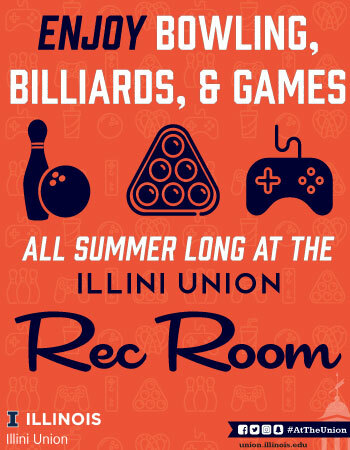 P. S. Be sure to have some fun on the Fourth of July – it’s the one day this summer that the Illini Union Rec Room is CLOSED! Fan Appreciation Night. Includes full show and fireworks. General admission is $5. A full day of 4th of July festivities, with a parade at 2pm featuring a replica of Lincoln's hearse and culminating in one of the biggest fireworks displays in Central Illinois at dusk. This day-long fest features a parade, touch-a-truck, bounces houses and more, concluding with fireworks at dusk. 1K and 5K and Golf cart parade on Friday evening. Saturday activities include parade at 11am, all day activities and fireworks and entertainment at dusk. Some activities include a fee (petting zoos, inflatables, helicopter rides); no fee for the parade/fireworks. Celebrate Independence Day in style with the best in American music performed by the Champaign-Urbana Civic Wind Band. Frozen yogurt served outside the theatre at 5pm and music begins at 7pm. Ticket prices range from $12.50 to $19.50. Fun for the entire family beginning at 3 pm! Fireworks at dusk, inflatables, concessions, bike parade, live music, and car show. Enjoy activities including kid zone, car show, entertainment and fireworks at dusk. Annual fireworks, food and fun festival at Lodge Park. Free admission. Ride the train from downtown Monticello to watch the fireworks at Lodge Park! Tickets are $12 for adults and seniors and $10 for children 2-12. Children under 2 ride FREE with paying adult or senior. Begin the morning with a 5K run/walk, then later the parade sets off in Champaign at 11:05 a.m. Bring your blanket or lawn chairs and enjoy. Evening festivities begin at 7pm with musical entertainment, inflatables and spectacular fireworks (around 9:15). Parade, fishing derby, frog jumping contest (with real frogs!) and more. The day wraps up with fireworks over Lake Sibley. Parade at 11, entertainment and food begins at the park at 4, fireworks at dusk. Take the provided shuttle to and from the park! Enjoy daytime activities at Pells Park like a bounce house, face-painting, and watermelon eating contest. Head to Bixby Park in the evening for fireworks, food and more fun! All day celebration, including festivities and fireworks. Dunk tank, free hot dogs (first 300 people), donut eating contest and more. Fireworks at dusk. Enjoy a fun, kid-focused morning at this small neighborhood parade. Meet at Prairie Fields parking lot shortly before 9am with your bikes/strollers/wagons/children and pets decorated for the festivities! We will depart the park at 9am and return around 9:15am. The route will be the usual "Prairie Fields Parade Route" starting on Gentian, heading North on Tickseed, and East on Dropseed back to the park. The Rantoul Freedom Celebration Parade kicks off at 9:30am. A small neighborhood parade led by a fire truck! A small-town parade in downtown Seymour to celebrate the 4th of July! Tractors, floats, candy and more! Kids’ activities, food, live entertainment, fireworks at dusk. Admission is $2 per person with kids 5 and under free. Near Village Hall. Parade at 4 pm, fun games, and fireworks (bigger and better than ever!) at dusk. Free. $4 per person admission to the baseball game, which will be followed by fireworks. There's also a $4 hot dog/soda combo! Rt. 51 South and Kleeman Dr.
A full day of activities including a 5K, 3-on-3 basketball tournament, parade at 10 am, children's activities at 11 am, live music and fireworks at dusk at Ervin Park. Send us your Fourth of July-related event – submit your event here. Want more info like this directly in your inbox? Sign up for the Chambanamoms weekend planner email newsletter.